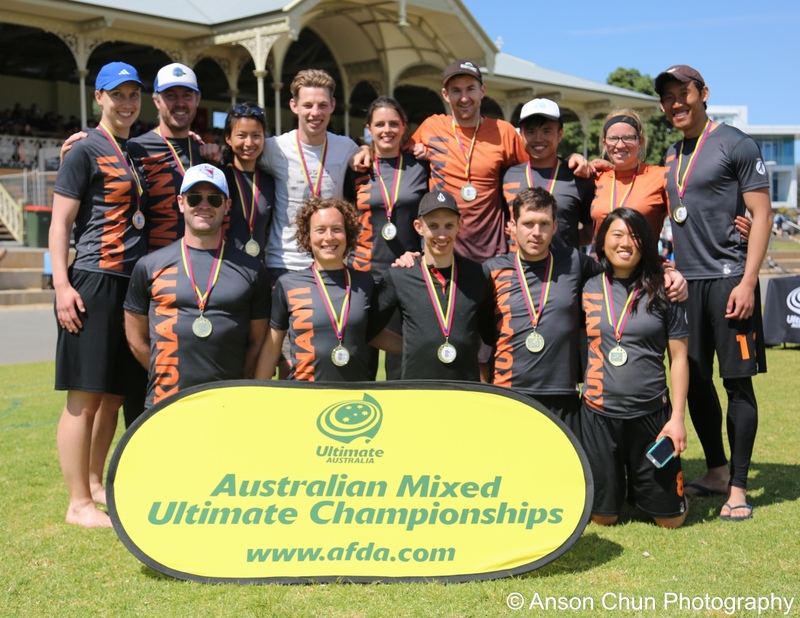 Tasmanian Ultimate reached great heights at this year’s Australian Mixed Ultimate Championships, with Kunanyi finishing in a creditable 18th position and being named the most spirited team at the tournament. After many months of build-up, a squad of 14 players headed to Adelaide ready to face off against the top teams in the country. The squad spent a number of months training for the tournament, with weekly training sessions led by Rob Skelton complimented by smaller pod sessions under the watchful eye of Leo Chia. And the training paid off, with some slick Ultimate on show in Adelaide. Captained on the weekend by Michelle Rogers and Mike Baker, Kunanyi arrived in South Australia seeded 18th and in a tough looking pool that included Big Show and Racquet & Disc from Melbourne and Le Grande Coq Sportif from Sydney. The tournament got off to a slightly shaky start on Friday morning, with the team needing a bit of time to gel, having only played together as a full squad in two scrimmages prior to the tournament. With a few cobwebs out of the way after an opening defeat to Pillow Fight from Canberra, Kunanyi came back strongly against Racquet & Disc, giving the Victorian outfit a few scares before going down 17-13. Conditions were not favourable on the opening day, with sweltering temperatures reaching 34 degrees. With winter having only recently abated in Tassie, the heat took its toll on the squad and that was evident in a 15-10 defeat to Knight Raiders. The disappointment of going without a win on day one certainly didn’t get to the team who came out firing on day two. Facing Big Show – the second seeds in the tournament – first up on Saturday, Kunanyi played their best Ultimate. Slick offense was complimented by hard defence as Kunanyi showed they were not to be trifled with. Big Show rallied to claim a 16-10 victory after taking the half 9-7. Despite the result, the match was a highlight for the squad whose united front and positive attitude had seen them give one of the tournament’s big guns a run for their money. Next up was a clash with Le Grande Coq Sportif, the second seeds in Kunanyi’s pool. Still on a high from their tremendous performance against Big Show, Kunanyi upped their level even more as they edged Le Coq in a hard-fought and tightly contested battle, emerging victorious 16-10 in what was one of the biggest upsets at the tournament. It turned out that the winning feeling was one that Kunanyi quite enjoyed and one win soon became two as Happy Pig of Western Australia were easily dispatched 17-5 to end a fantastic day of Ultimate. Kunanyi was not done though, and another commanding performance opened the final day. A 16-5 win over Burley Griffins of Canberra saw Kunanyi enter a battle for 17th spot with their conquerors of day one, Pillow Fight. Unfortunately there would be no revenge for Kunanyi though, with Pillow Fight claiming a 12-8 victory. The results alone were enough to leave Kunanyi buoyed, but there was more to come as the Tassie team was awarded the acclaimed spirit award on the basis of their spirit scores across the weekend. The 2015 Kunanyi squad were rewarded for their hard work with three wins, a spirit medal and plenty of fantastic memories. For Tassie Ultimate, it will hopefully be the first chapter in a new era of continued success for the state.